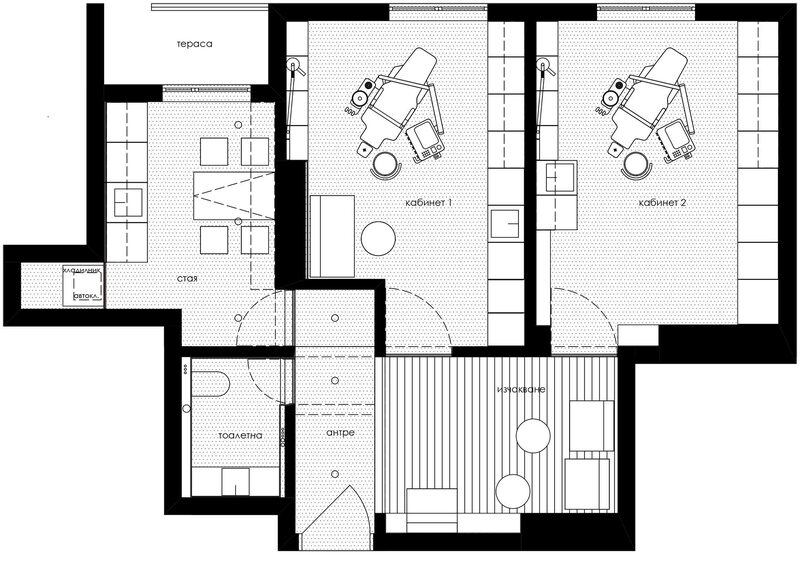 An existing apartment on the ground floor of a building from the 1930s in central Sofia is transformed into a dental clinic with 2 rooms equipped for dental examination, with an area for panoramic radiographs, a dental supplies sterilization area, a waiting room for patients and a recreation area with a terrace­­. The projects objective was the creation of a bright and open space, compliant with the high requirements of a modern dental practice and meeting the client’s expectations. The furniture in the two rooms for dental examination is designed and manufactured especially for the clinic. Apart from storing the dentist’s archive and smaller dental supplies, it accommodates the built-in larger dental equipment which can be put away when not in use. All air conditioners are also built-in. Furniture: medium density fibreboard /MDF/ - white painted / oak veneer.